Construction will begin in November on a new building near Long Marine Laboratory at the UC Santa Cruz coastal science campus. The Coastal Biology building will support research and teaching on coastal conservation, ecology, habitat restoration, climate change impacts, and policy. 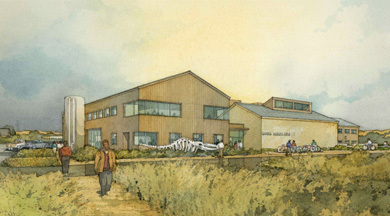 Faculty and researchers in UCSC's Department of Ecology and Evolutionary Biology will come together in the Coastal Biology building after many years in which some were based on the main campus and others at Long Marine Laboratory. The new building will relieve space constraints and allow for the expansion of programs in coastal sustainability and conservation biology. "Reuniting the department will be a huge plus for our faculty and students," said department chair Peter Raimondi, professor of ecology and evolutionary biology. "The facilities themselves will be great, with exceptional research labs, a teaching lab with freshwater and seawater, greenhouses, and areas where students can hang out. It will be a great place to work and learn." Gary Griggs, director of UCSC's Institute of Marine Sciences, said the Coastal Biology building will enable more effective interactions not only among faculty and students within the department, but also with other groups based at the Coastal Science Campus. These include scientists with the National Marine Fisheries Service (NOAA Fisheries) and California Department of Fish and Wildlife, as well as conservation organizations like the Nature Conservancy. "We have a growing community of scientists studying issues related to coastal sustainability, conservation, and ocean health, and these are the issues that motivate a lot of our students as well," Griggs said. "We're working on problems at the ocean's edge, on both the terrestrial side and the marine side of the coastal zone." 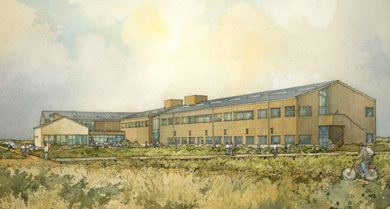 The Coastal Biology building is the first major construction project to be carried out under UCSC's Coastal Long Range Development Plan (CLRDP), which was approved by the California Coastal Commission in 2009. The CLRDP is a comprehensive land-use plan for possible future development at the Coastal Science Campus, providing clustered development zones for new facilities while setting aside 72 acres of the 100-acre site for environmental restoration and preservation of sensitive habitat. "Only about 25 percent of the site will ever be built on, so most of it will remain open space and will be protected and restored as part of Younger Lagoon Reserve," Griggs said. "The ongoing habitat restoration work provides great opportunities for research and hands-on teaching activities." Part of the UC Natural Reserve System, Younger Lagoon Reserve was established in 1986 as a 25-acre reserve of lagoon, beach, marsh, and coastal bluff habitat adjacent to Long Marine Laboratory. In 1999, UCSC purchased from Wells Fargo Bank approximately 55 acres of the upland terrace next to Long Marine Lab, of which 47 acres have been added to Younger Lagoon Reserve. The developable area where the Coastal Biology building will be constructed, which may include additional buildings in the future, has been named the Wells Fargo Coastal Science Research Center. The new building will be just north of the NOAA Fisheries lab building, with a new parking lot adjoining the existing NOAA parking lot. The construction project will also include a number of major infrastructure upgrades called for in the CLRDP, including paths for walking and biking, overlooks with interpretive panels, improvements to underground utilities, and a small public access parking lot. The Coastal Biology building was designed by the San Francisco architecture firm EHDD. The main building is 40,000 gross square feet on two floors, with offices and laboratories for faculty and researchers, a 125-seat seminar room, a core seawater lab for research and teaching, and meeting spaces and conference rooms. An ancillary complex of greenhouses for research and habitat restoration work will be located across McAllister Way from the main building. Construction work is scheduled to begin in early November 2014 and is expected to be completed by fall 2016. More information about the project is available online at www.ucsc.edu/coastalbiology.